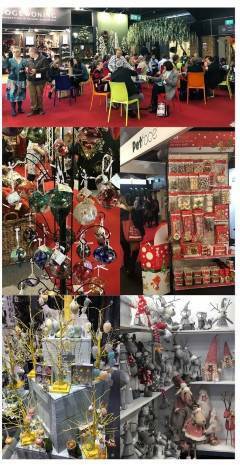 Harrogate Christmas & Gift 2019 got off to a bumper start today with buyers flocking to the show to see the latest new festive products the industry has to offer. From the moment you enter through the doors of the Harrogate Convention Centre, all the senses are bombarded. Smells from candles, diffusers, pine needles and scented pine cones waft through the halls; whilst tinsel, baubles and lights glitter and shimmer; and a distant melody of festive music can be heard under the hum of enthusiastic chatter. Many exhibitors are introducing new colourways and themes for Christmas 2019; and visitors are spoilt for choice with the diversity of new gift items from confectionery and greetings cards to Halloween and Easter ranges. The show is open for the next three days – Monday and Tuesday from 9am to 6pm and Wednesday from 9am to 4pm – so be sure come along to see everything the show has to offer first hand.